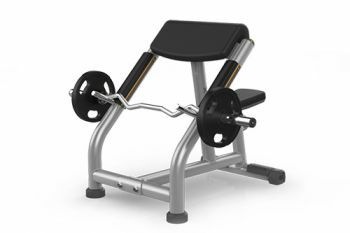 This piece of training equipment is suitable for those who would like to achieve strength in their biceps as part of their weight training exercise. The main muscle which contracts to lift the weight upwards during the biceps curl exercise is the two-headed muscle of the upper arm area called the biceps brachii muscle. The Preacher curl allows the correct targeting of this muscle and thanks to its angled, ratcheting seat it allows you to position your body properly while exercising. The machine also features durable extruded guards for frame and bar protection.